Our Satellite meetings are another exciting activity of the 2015 ISBNPA Annual Meeting. They are reaching their full capacity, so hurry up if you wish to attend. Follow this link for more information about the ISBNPA 2015 Satellite Meeting: Challenging interventions with an obese society-engaging without enraging, to be held in June 8 in St. Andrews University, Scotland. You can find more information on the events page of our website. Follow this link for more information about the ISBNPA 2015 Satellite Meeting: Determinants of sedentary behaviour across the life course: synthesis and consensus meeting, to be held in June 8 in Glasgow Caledonian University, Scotland. You can find more information on the events page of our website. The International Society of Behavioral Nutrition and Physical Activity (ISBNPA) will host its 14th Meeting in Edinburgh, one of the world's most historic and enchanting cities. The meeting will be held in Edinburgh International Conference Centre (EICC) in the heart of the city centre. The scientific programme will consist of keynote, plenary lectures from world leading researchers. Parallel sessions of symposia, short orals and workshops will provide key updates and debate on recent progress in theory, methods and new findings related to physical activity and nutrition behaviour. Scientific poster sessions will feature informally during luncheon and also during two 90 minute sessions of plenary poster discussion. 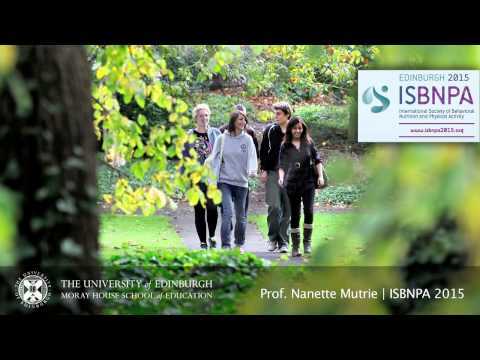 Professors Nanette Mutrie and Annie Anderson are delighted to invite you to attend ISBNPA's 2015 meeting in Edinburgh, Scotland's capital and a designated UNESCO World Heritage Site. Professor Mutrie is Chair of physical activity for health at the University of Edinburgh where she directs a newly established research centre on this topic (Physical Activity for Health Research Centre). Professor Anderson is a public health nutritionist and dietician at the University of Dundee where she directs the Centre for Public Health Nutrition Research and co-directs the Centre for Research into Cancer Prevention and Screening. With co-chairs in physical activity and nutrition you can be sure that the scientific programme will feature ground breaking research findings, key debates and internationally renowned keynote speakers across both fields of physical activity and nutrition behavior change. The ISBNPA 2015 Annual Meeting will host a plethora of workshops. Find more about them on the following link. We are supporters of the SPCN Healthy Meetings Initiative (http://www.cancerpreventionscotland.org.uk/what-we-do/healthy-meetings/). Click HERE if you to access the scorecard of this initiative. Please visit the website for more information: www.isbnpa2015.org.